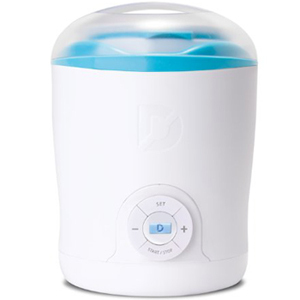 The Dash Greek Yogurt Maker is one of the most popular yogurt makers on the market! Making yogurt from scratch is a healthier alternative to store bought yogurts with unhealthy additives. Q: Does the Dash make True Greek Yogurt? A: Any yogurt can become "greek style" as long as the whey is strained through cheesecloth to the desired thickness. Q: Can the Dash make Vegan Yogurt? A: Yes. Coconut milk and soy milk are vegan alternatives to dairy such as cow milk and goat milk. Q: How Much Yogurt Does the Dash Yield? A: 2 to 5 cups depending upon the recipe used. Q: Are any of the Parts Dishwasher Safe? Q: Where can I purchase the Dash Greek Yogurt Maker?